In a major setback to the Rashtriya Janata Dal, a special Central Bureau of Investigation court on Saturday convicted former Bihar chief minister Lalu Prasad and 15 others in a fodder scam case 21 years after it had surfaced, while acquitting six others including another former chief minister Jagannath Mishra. Special judge Shivpal Singh pronounced the verdict in a packed courtroom in the case pertaining to fraudulent withdrawal of Rs 89.27 lakh from the Deoghar Treasury between 1991 and 1994. The court will pronounce the quantum of sentence on January 3. The copy of the judgement was not immediately available. Sixty-nine-year-old Lalu Prasad, who heads the RJD, and other convicts were taken into custody immediately after the pronouncement of the verdict. Lalu Prasad's son Tejaswi Yadav, who is the Leader of Opposition in the Bihar assembly, was present in the court. Lalu Prasad and other convicted in the fodder scam case were then whisked off to Birsa Munda jail, where security has been tightened, CBI sources said. 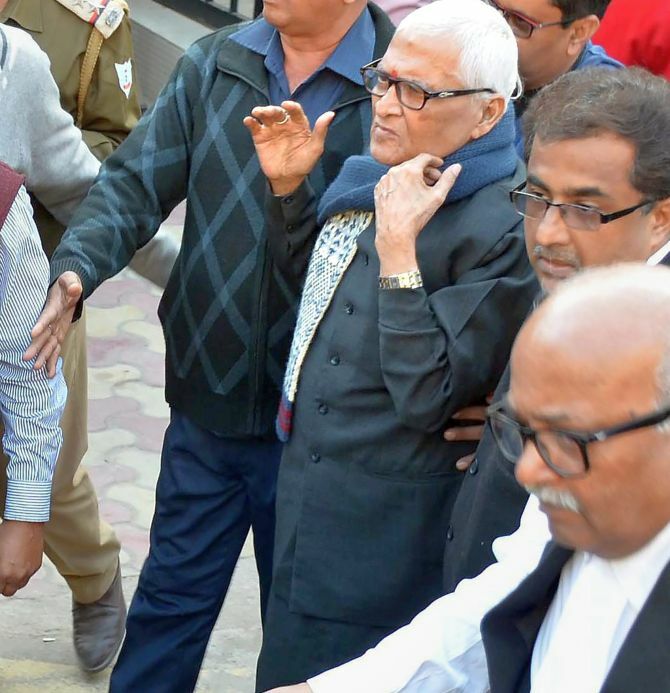 The special court acquitted 80-year-old Jagannath Mishra and five others -- former Public Accounts Committee chairman Druv Bhagat, former Indian Revenue Service officer A C Choudhary, fodder suppliers Saraswati Chandra and Sadhana Singh and former minister Vidya Sagar Nishad. Besides Lalu Prasad, the court convicted political leaders Jagdish Sharma and R K Rana, IAS officers Beck Julius, Phoolchand Singh and Mahesh Prasad, and government officials Krishna Kumar and Subir Bhattacharya. The others are suppliers/transporters Tripurari Mohan Prasad, Sushil Kumar Sinha, Sunil Kumar Sinha, Raja Ram Joshi, Gopinath Das, Sanjay Agarwal, Jyoti Kumar Jha and Sunil Gandhi. In 1996, the Patna high court ordered an inquiry into the fodder scam cases and a chargesheet in the Deogarh treasury case was filed against 38 people on October 27, 1997. Eleven of them died and three turned approvers while two other accused confessed and were convicted in 2006-07, a CBI official said. The accused faced charges under various sections of the IPC and the Prevention of Corruption Act. The court had on December 13 reserved its on the matter. Senior RJD leader Raghuvansh Prasad Singh said that the party would move the high court against the special CBI court order. Soon after the verdict, a post on Lalu Prasad's Twitter handle read, "Powerful people and powerful classes always managed to divide society into ruling and the ruled classes. And whenever anyone from the lower hierarchy challenged this unjust order, they would be deliberately punished." "Had people like Nelson Mandela, Martin Luther King, Baba Saheb Ambedkar failed in their efforts, history would have treated them as villains. They still are villains for the biased, racist and casteist minds. No one should expect any different treatment," added another tweet. On September 30, 2013, Lalu Prasad, Jagannath Mishra and several others had been convicted in another case pertaining to illegal withdrawal of Rs 37.7 crore from Chaibasa Treasury in the early 1990s. Saturday's conviction is the second in the scam. The Supreme Court had granted bail on December 13 that year to Lalu Prasad, who had been behind the bars for two months. He had moved the apex court challenging the order of the Jharkhand high court which had dismissed his bail plea. 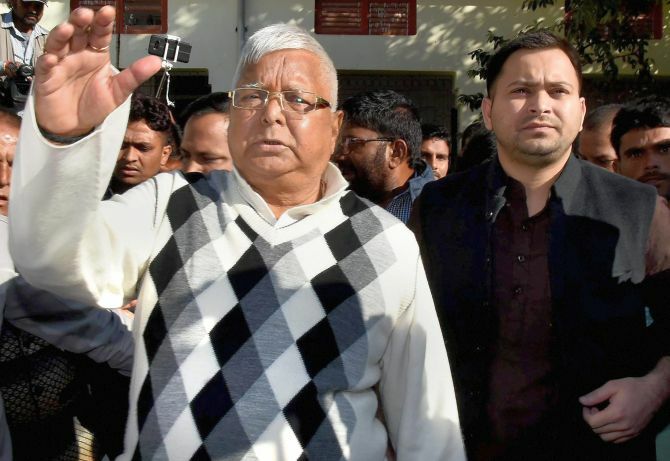 Lalu Prasad faces another three fodder scam cases for illegal withdrawal of Rs 3.97 crore from the Dumka Treasury, Rs 36 crore from the Chaibasa Treasury and Rs 184 crore from the Doranda treasury. "The legal fight will continue," Raghuvansh Prasad Singh told reporters outside the special CBI court here reacting to the conviction of the RJD chief. He said that besides fighting it legally, the party would go to the people "fight it politically also". Another senior RJD leader, Abdul Bari Siddiqui, a confidant of Prasad, said it was not right to comment on a judgement but the people were discussing how it is freedom for some people and jail for others in the same case. "The layman is asking why it is jail for some and freedom for others? It is baffling how the BJP and the JD-U had predicted the verdict. This has created confusion among the people also," he said. "The case was on excess withdrawal from Deogarh treasury. Laluji has been charged with connivance as he was the finance minister then the charge is not direct. The withdrawal had been taking place since 1977. There were several chief ministers who were in charge of the finance department when Laluji was not the finance minister or the chief minister so why is he being singled out?" Siddiqui asked. "Laluji's going to jail is not new for the RJD. He had been sent to jail on earlier occasions and every time the RJD bounced back with double the strength. That is why we are still number one in Bihar," he said. The party was waiting to know the quantum of punishment to Lalu Prasad to be pronounced on January 3 and would then decide its course of action, Sidiqqui added.